Varalakshmi Vratham is an important Puja, dedicated to Goddess Varalakshmi (Vara = boon, Lakshmi = goddess of wealth) another name for Maa Lakshmi, observed by married women for the well being of all the family members, especially husband, to get progeny etc. In the kingdom of Magadha of yore, there lived a Brahmin woman called Charumathi in a town named Kundina. .. Impressed by her devotion to her family, Goddess Mahalakshmi appeared in her dream and asked her to worship Vara-Lakshmi and seek to fulfill her wishes. The prayer/worship was prescribed to be offered on the Friday of Sravana month preceding the night of full moon. .. Following guidelines of Goddess Lakshmi, Charumati cheerfully invited all her neighbors and near dear people to take part in her Varalakshmi Vrat and pooja. 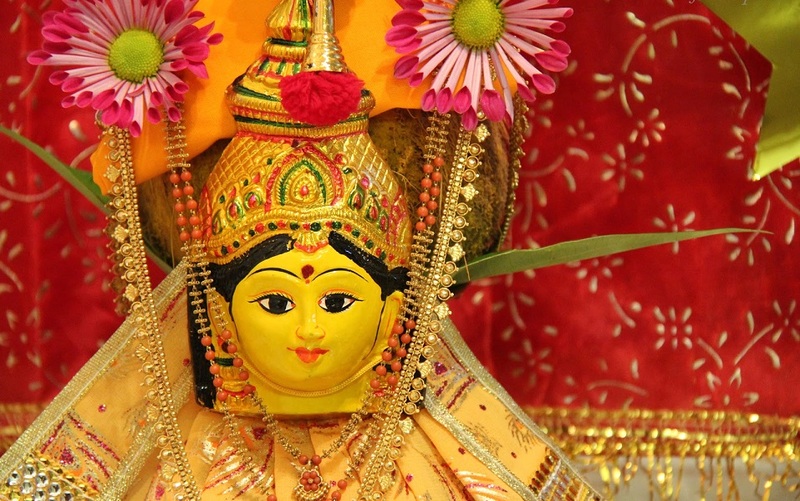 With immense devotion she observed fast, performed pooja and delighted Goddess Varalakshmi. .. Observing her pious efforts and great devotion, Goddess Laksmi blessed not only her but also all present people over there. Charumati and all present people were offered abundant wealth and long-life prosperity by Varalaksmi Goddess. .. There was a small tiff between Lord Shiva and Goddess Parvati while playing a game of dice. Unable to decide who was the winner of the game, they asked Chitranemi to give the verdict. .. Chitranemi, being the humble servant of Lord Shiva declared Lord Shiva as the winner. This upset the Goddess and cursed Chitranemi to turn into a leper. .. Helpless and anxious Chitranemi sought the help of Lord Shiva. 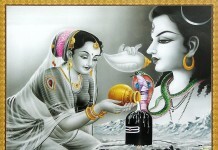 Lord Shiva pleaded Goddess Parvati to relieve him from the curse. .. Goddess Parvati relented and mentioned that Chitranemi would be cured of the disease if he watched Varalakshmi Vrat performed by pious women. Such is the sacredness of the Vratam. 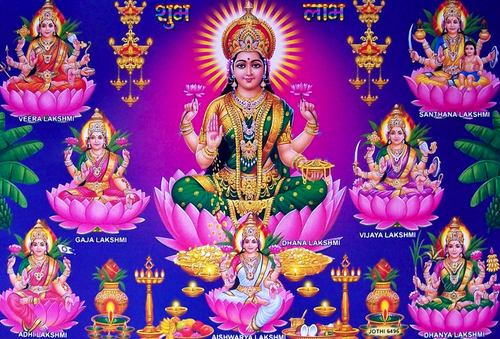 Ever since, women follow the tradition of worshipping Goddess VaraLakshmi on this day. .. Yet another legend that surrounds this Vratham is the popular story of #Shyamabala. She was the daughter of King Bathrasiravas and Queen Surachandrika. She was married to a prince in the neighboring kingdom. .. One day, an old lady, came to the Queen and advised her to perform the Varalakshmi Pooja/Vrat. The insensitive queen was rude and drove her out. .. However, the princess Shyamabala invited the old woman, listened to the greatness of the Vrat and decided to perform the Vrat. Soon, she could see that her husband and the kingdom started prospering with all riches. .. But her parents were suffering due to loss of wealth and people revolting against their rule. Their daughter sent them pots of gold with an intention to help her parents. But the pots of gold turned into ashes the minute the Queen set her eyes on them. .. Shyamabala realized this was due to the sin committed by her mother, the Queen when she drove the old lady away. She realized that the old woman was Goddess Lakshmi in disguise and requested her mother to ask forgiveness to the Goddess and perform the Vrat. The queen followed her suggestion, and she immediately got back the lost glory. As the legend goes, this is a pooja that was pronounced by no other than Lord #Parameswara to be performed by his consort #Parvathi to seek prosperity and happiness for the family. Thus it came to be emulated by married women who sought boons (varam) for the health, wealth and knowledge for the entire family. In some cases, women prayed for being blessed with children.